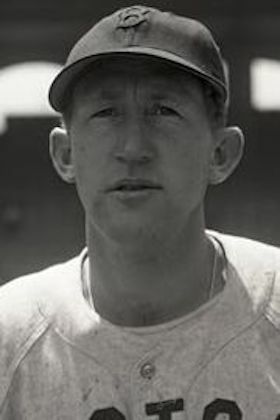 Jackie Tobin's older brother, Jim Tobin, pitched in the major leagues from 1937 through 1945, first for the Pirates, mostly for the Boston Braves, and then for the last several weeks of his career for the Detroit Tigers. Though Jackie, an infielder, was a little more than eight years younger, the two played in Boston – Jackie for the Red Sox – for most of 1945, his only year in the big leagues. Their parents were Richard Tobin and Hannah ‘Annie’ (O'Leary) Tobin, both natives of Northern Ireland. Annie was naturalized in 1900, Richard in 1906. They lived in Oakland, California, and had three children at the time of the 1930 census: Richard, James, and John Patrick "Jackie" Tobin. Father Richard worked as a railroad track repairman, Annie worked as a presser in a cleaning plant, and young Richard, 18 at the time, as a printing apprentice in a department store. Jackie was born on January 8, 1921 in Oakland. Both Jim and Jackie were an even six feet tall and both threw right-handed. Jackie, however, batted lefty. He is listed at 165 pounds, his brother Jim 20 pounds heavier. Jim's major-league record was a 3.44 earned run average with 105 wins and 112 losses. He had spent his whole time in the National League until August 9, 1945, when the Detroit Tigers purchased his contract from the Boston Braves for a reported $15,000. This took one of the brothers out of Boston but set up a scenario whereby Jim could have pitched to Jackie when the Tigers played the Red Sox in August and September. But Tobin was never asked to face Tobin. No doubt they saw each other across the field. Given the strictures of the day, they likely didn't "fraternize" on the field. Jackie attended St. Anthony's in Oakland for eight years, then Oakland High School. After graduation from high school he went on to attend St. Mary's College of California in Moraga, a college known for a very impressive baseball program. Over the years, this one small college has produced an astonishing number of major league ballplayers -- 63 in all! The most recent ones are Mark Teahen, James Mouton, and Tom Candiotti. The Red Sox alone count the following former St. Mary’s men among their own alumni: Frank Arellanes, Bill Fleming, Harry Hooper, Bill James, Earl Johnson, Dutch Leonard, Duffy Lewis, Jim McHale, and Emmett O’Neill. Tobin spent 2 ½ years at St. Mary's. Had he not gone into baseball, he would have played professional basketball, Tobin said in an American League questionnaire on file with the National Baseball Hall of Fame. Tobin was likely recommended to the Red Sox by Earl Sheely, St. Mary's baseball coach, who had seen St. Mary's student Emmett O'Neill signed to the Red Sox in 1940. Signed on January 3, 1942, Tobin's first year in pro baseball was with the Louisville Colonels in 1942 – but he only played two months before he entered the United States Navy. Classified 1-A and subject to the draft at any moment, he decided to enlist in the Navy instead. With the Colonels, he showed to good advantage in a spring training game against the Red Sox, driving in three runs in Louisville's 10-6 win over Boston on March 17. He appeared in 92 regular-season games and hit for a .250 batting average (with a .323 on-base percentage), playing most of his games at third base but 18 of them at second base. The Boston Braves and Boston Red Sox always played a preseason City Series in those days and one might have hoped to see Tobin vs. Tobin. Bob Coyne's sports page cartoon in the April 15 Boston Post mused (with an allusion to then-serving Massachusetts Governor Maurice J. Tobin), "How this guy Tobin finds time to play second for the Red Sox, pitch for the Braves and be Governor – I dunno!!" The matchup didn't come about. Jack was 2-for-4 with a double in the first game, 3-for-5 with a single, double, and a home run into the "jury box" at Braves Field (with a total of four RBIs) in the second game, and didn't play in the third. Jim Tobin didn't pitch in any of the three games. The unresolved question was where, and to some extent when. On the eve of Opening Day, Cronin said, "In case Tobe is unable to play for a few days, I'll step into the lineup at third myself. "5 Cronin did play in the season's first three games, but fractured his leg on April 19. When 27,000 fans flocked to Fenway for the May 27 doubleheader against the White Sox, they saw Dave "Boo" Ferriss throw a one-hitter for a 7-0 win in the first game, running his rookie record to 6-0. Jackie Tobin drove in three. Tobin's fellow St. Mary's alumnus, Emmett O'Neill, won the second game for Boston, 2-1. Tobin had a game-winning hit, breaking a 3-3 tie in the eighth inning of the first game on June 3. He helped Ferriss win his 13th game on July 4, breaking another 3-3 tie, this time in the top of the ninth in Detroit. He won the first game on September 19, too, driving in three runs, including the tying and go-ahead runs in the bottom of the eighth, beating the Athletics, 11-10. It was easy to mock Jim after a dinky little single. Jim already had plenty of accomplishments under his belt, including two no-hitters in 1944 and a game in 1942 when he – the pitcher – hit three home runs. All in all, Jack Tobin appeared in 84 games and hit for a .252 batting average (.320 on-base percentage) with 21 RBIs. In 72 games at third base, his fielding percentage was .951 in 245 chances. The war was over before the 1945 season ended and all the veterans were coming back, including Bobby Doerr and Johnny Pesky in the infield. We see in retrospect that Tobin's time in the big leagues was up, but he embarked on a lengthy and successful minor-league career starting in 1946. After training with the Boston ball club in Sarasota, on March 23 he was optioned to the New Orleans Pelicans, a Red Sox affiliate in the Double-A Southern Association. He played in 137 games for the Pels and had a very good season, batting .301. In 1947 he played in the Double-A Texas League for the Tulsa Oilers. He had a similar season, with a .291 batting average in 117 games. He saw his average drop to .252 in 1949 and then .243 in 1950. Though he sometimes played one or another infield position, Tobin typically played outfield for the Seals. He never hit many homers (just 20 in 1,271 professional games), but one that stood out was his pinch-hit grand slam in the top of the 10th inning against San Diego on July 20, 1950. Oddly, he later hit three home runs in his first five days of the 1953 season, then didn't hit another one until he hit an inside-the-park home run on April 25, 1957. In October 1950, the Seals released Tobin conditionally, then traded him on December 6 as part of a four-player trade with the San Diego Padres. Tobin played 1951 and 1952 for the Padres. He hit .252 in 87 games in 1951, working almost equally at third base and in the outfield, but played a full 166 games in 1952 (almost all in the outfield) and hit for a .287 average. Some leg tightness kept him out of the lineup for the last three weeks of the season. He played outfield almost exclusively, and set a career high in RBIs in 1953, driving in 58 while usually leading off, with a .296 average. In late August, Bay Area sportswriters voted him Player of the Year. The following year, things fell off significantly after a horrendous collision in the outfield early in the season injured both his leg and head. He was hampered all season long and wound up with a .248 average and only 28 RBIs. In January 1955, he was acquired by the Sacramento Solons. He tore a ligament in his left heel in a May 1955 game and missed about a month, but he put together decent back-to-back seasons in 1955 and 1956, batting .270 and then .283, though only playing in more or less half the games both years. He married in June 1956. Tobin played 20 games for Sacramento in 1957, batting .315. In May he was traded with Gene Bearden to the Minneapolis Millers (in the Triple-A American Association). He played in 42 games for the Millers, batting .283, and in late July was optioned to the Eastern League's Springfield (Massachusetts) Giants as a player-coach. He got into 29 games, but only hit .127. They were the last two clubs for which he played. He was hired to umpire in the Pacific Coast League beginning in 1959. The league had immediately suspended him, though, and he was kept in Hawaii for three weeks before being cleared. The incident, fairly or not, tarnished his record. As Seattle Daily Times columnist Hy Zimmerman wrote in 1972, "His dossier was dirty. "14 His work in baseball was done. Tobin moved on to other pursuits. After baseball, Tobin took up work as a material control warehouseman with Pacific Gas and Electric and made his home in Oakland. An apparent heart attack in his apartment ended his life 10 days after he had turned 61, on January 18, 1982. In addition to the sources noted in this biography, the author also accessed Tobin's player file and player questionnaire from the National Baseball Hall of Fame, the Encyclopedia of Minor League Baseball, Retrosheet.org, Baseball-Reference.com, and the SABR Minor Leagues Database, accessed online at Baseball-Reference.com. 1 Dan Daniel, "Daniel's Dope," syndicated column datelined April 10, 1945. See also Associated Press article in the Cleveland Plain Dealer, March 10, 1945: 12. 2 Cookie Lavagetto was a teammate on the Oakland Naval Air Bases team. See, for instance, Will Connolly, "All Bluejacket Day – Air Base and Receiving Ship Nines Win," San Francisco Chronicle, May 3, 1943: 17. 3 Arthur Sampson, "Sox Announce Five Veterans Already in Fold," Boston Herald, March 10, 1945: 7. 4 Associated Press, "Service Veterans Key Men in Majors," New York Times, May 1, 1945: 18. 5 Arthur Sampson, "Cronin Sends Cecil Against Yanks Today," Boston Herald, April 17, 1945: 10. 6 "Sox Drought Ends, 8 to 4," Boston Herald, April 29, 1945: 68. 7 Harold Kaese, "Red Sox Defeat braves, 8 to 1," Boston Globe, July 11, 1945: 6. 8 Hy Hurwitz, "Ma Can Throw Harder!" Boston Globe, July 11, 1945: 6. 9 Tom Kane, "Solons Exchange Ritchey for Three Seattle Ball Players," Sacramento Bee, January 8, 1955: 13. 10 "John Patrick Tobin," Sacramento Bee, January 8, 1955: 13. 11 Lenny Anderson, "Sports Before Your Eyes," Seattle Daily Times, March 29, 1953: 48. 12 "Tobin Bears No Marks As Result of Fresno Tiff," Sacramento Bee, May 10, 1958: 10. 13 Associated Press, "Tobin Clear of Charges," The Oregonian, September 2, 1961: 16. 14 Hy Zimmerman, "Loose Tongue Grounded Tobin," Seattle Daily News, December 21, 1972: 40.